WHY CHOOSE ICELAND EN ROUTE? Winter in Iceland surely creates magical meetings that make Iceland’s most photographed landscapes take on an entirely different world. 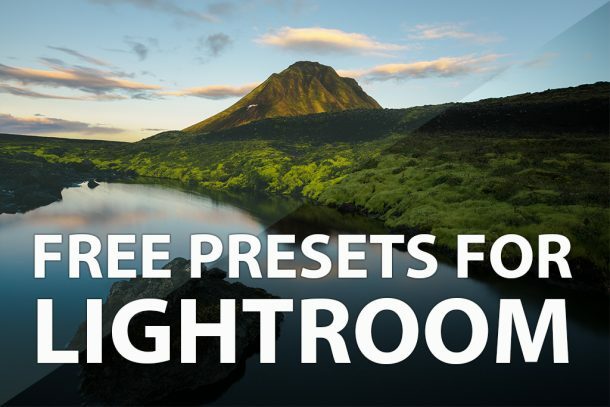 Contrasts of the black volcanic sand and wild rock formations covered by the white frosty sheaths of snow is simply a delight for all photographers, not to mention under the mysterious and ever-changing Aurora Borealis, the Northern Lights. The immense glaciers cast into lagoons with transforming crystal blue icebergs, frosty waterfalls and unique ice caves, reflecting blues you have never witnessed before, are forever enticing photo subjects. Our winter photography workshops offer the rare and unforgettable experience to enter the most beautiful yet ever changing ice caves of Iceland. 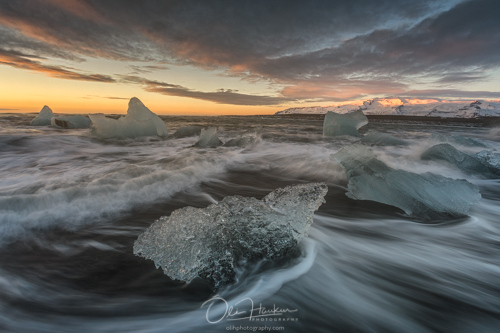 The amazing team of professional photographers from Iceland En Route, with their vast experience in landscape and winter photography, will guide you and make sure you reach the greatest locations at the best possible light conditions to capture unique images for your expanding portfolio. The silk like veils of the dancing Northern Lights in the winter night skies, according to science, are actually coalitions between electrically charged molecules from the sun, entering the earth’s atmosphere. This unique phenomenon can be seen around the magnetic poles in the northern and southern hemispheres and thus in Iceland. 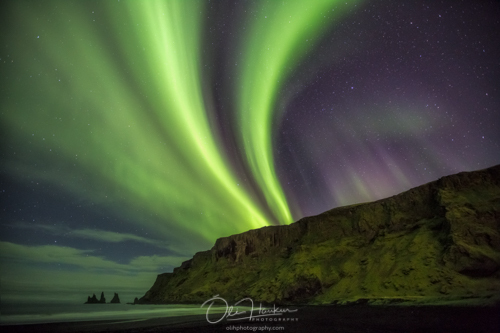 Northern Lights and its activity directly connected with solar storm activity, are indeed active all year long however can only be experienced in complete darkness, when the sky is more or less clear. 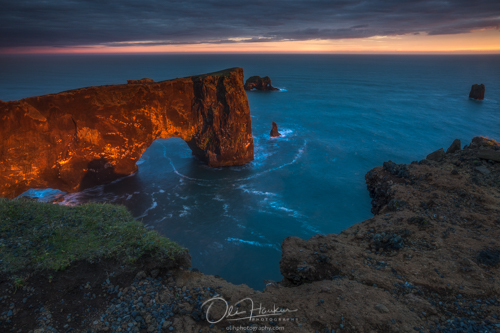 Thanks to the geographical position of Iceland, the sparse population and the long winter nights, we have statistically the best chance to capture this spectacular miracle of nature. The rugged, snow covered landscape, still lagoons and frosty waterfalls reflecting the dancing lights may harvest an image close to pure perfection. Upon arrival at Keflavik International Airport, please arrange your own transfer to the provided hotel in Reykjavik. You can easily take any flyBus directly to Reykjavík city center where your hotel is located. Our team meets in the hotel lobby for a dinner reservation close by, during which we get to know each other and review the Workshop schedule. We spend the night in Reykjavík. We start our photo journey along the South Coast capturing the legendary and loud however accommodating Skógafoss, one of the biggest waterfalls in Iceland, where we frequently experience double rainbows in the magical myst of the water. Legend tells of the first Viking settler in the area hiding a treasure chest in a cave behind the waterfall, possibly still to be found today. Further along the vast panoramic coastland, we discover the hidden gem of Reynisfjara beach. Geographically there is no landmass at all from the area to Antarctica and as a result this very south tip of Iceland is frequented with fierce winds and tides. As we step onto the black volcanic sand and pebble stone beach we ask you to be aware when capturing the basalt column cave, wild birds on the cliffs, curious seals and views of the trolls of Reynisdrangar, a family of overwhelming basalt column stacks heading out to sea. We spend the night in or around Vík, this tiny yet highly important service centre in the sparsely inhabited south. The village is known to be the warmest and yet wettest of spots in Iceland and is situated underneath the provocatively dormant Mýrdalsjökull Glacier. Vatnajökull National Park in south Iceland holds the largest contiguous glacier in Europe, Vatnajökull Glacier. The area is filled with natural wonders that we explore and enjoy for a few days. The glacier itself hides away a myriad of mysterious ever changing ice caves with only a few safe enough to enter. 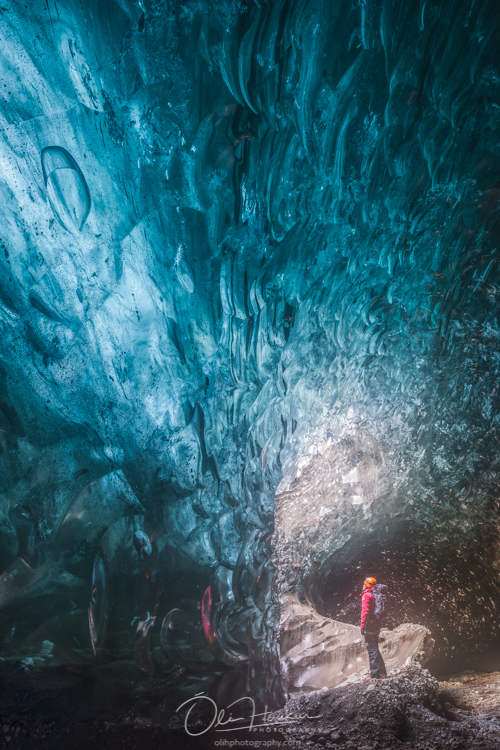 In summer, when glacial water runs from underneath the ice and through tunnels in the glacier, new caves are formed and the existing ones may collapse altogether. 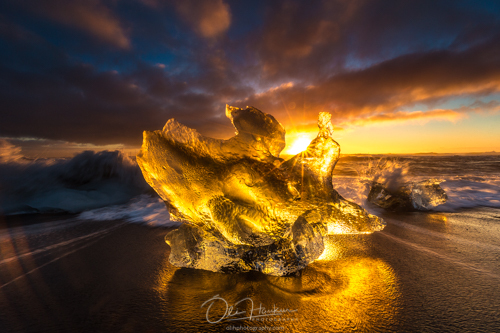 In fall, when water freezes again, new patterns and transparent ice formations and cavities are created, providing once-in-a-lifetime opportunities for photographers. Each tour is a unique and rare experience. 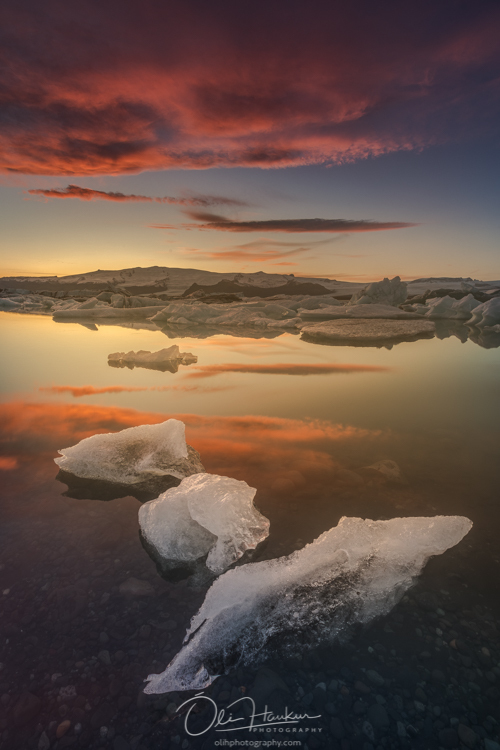 The renowned Jökulsárlón glacial lake on the edge of Vatnajökull National Park is admittedly one of the most picturesque crown jewel locations of Iceland. The tongue of Breiðamerkurjökull glacier descends into a lake and huge ice blocks, as old as one thousand years, melt and cast into the lagoon, traversing the lagoon out to the open Atlantic ocean. Mesmerizing seals are commonly seen in the estuary and even on the floating icebergs. 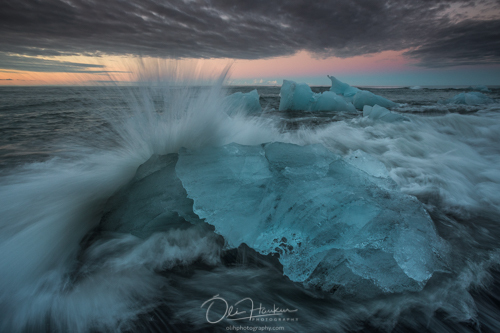 During the workshop we stop several times at both Jökulsárlón and Fjallsárlón, the latter being a relatively newly discovered and less frequented lagoon, offering equally spellbinding photo opportunities in different light and weather conditions to capture the impressive progression of the different variety blue icebergs. 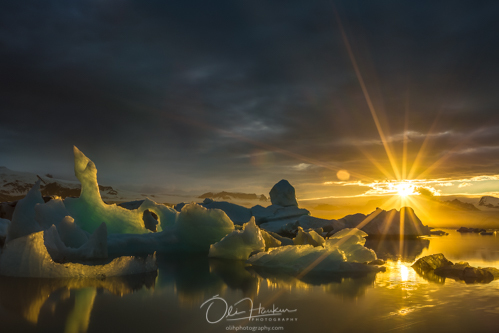 Our dream is to facilitate the opportunity for all photographers to fulfill their dream; to witness the Aurora Borealis dance over the icebergs, reflecting their light on the surface of the lagoon. In the vicinity of the fishing and tourist village of Höfn we witness the weather dynamic area of Stokksnes with the 454m high Mt. 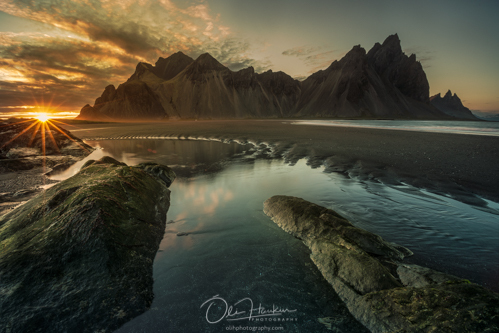 Vestrahorn, an impressive geological phenomenon composed of unstratified plutonic rock, mostly gabbro and granophyre. 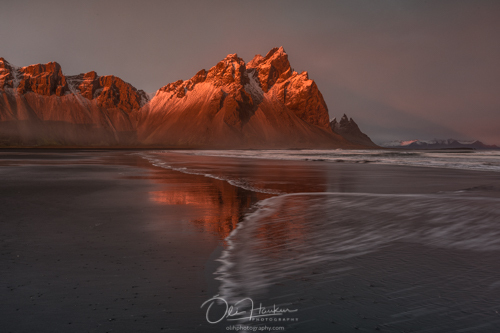 The area is one of the first settled in Iceland and played an important role during World War II for the British army and later with NATO, as they constructed their radio station at Stokksnes. We spend our nights at a hotel near Vatnajökull Glacier. After spending these few days in Vatnajökull National Park we head back towards Vík with a few scenic stops, first at the old ecclesial farm of Hof situated under Öræfajökull glacier where Iceland´s highest peak, Hvannadalshnjúkur is also to be found. The Hofkirkja Church, originally built in 1884, is the last church built traditionally with turf and is one of six remaining turf churches in Iceland. Surrounded by tussocks the site gives a distinctive sensation of the land enveloping this little, unique church right under the majestic peak. Easily accessible from Skaftafell and not far from Hofkirkja Church, we take a short walk to the tongue of Svínafellsjökull Glacier. Under the crackling sounds of the ice in motion, our lenses are invited to capture this wonder of the ice mass reaching out from its source. Driving along the black sands back to Vík, we reach the vast lava fields of Eldhraun (The Fire Lava) that covers about 565km. This breathtaking lava field emerged from one of the most devastating eruptions in historic times, Skaftáreldar (the Fires of Skaftá River) that also produced the craters of Lakagígar in the late 18th century. The rough and rugged lava covered by the smooth green moss in the frosty white bonds, has the ability to shut off the whole world for a moment or two. We stay overnight in Vík again. The national park Þingvellir. The Þingvellir area is part of a fissure zone running through Iceland, being situated on the tectonic plate boundaries of the Mid-Atlantic Ridge. The faults and fissures of the area make evident the rifting of the earth’s crust. You´ll walk through those fissures and get a glimpse of the sagas and the old Iceland from the Viking age in. Thingvellir is on the World Heritage list for its cultural values but it´s also a natural wonder on an international scale. The waterfall Gullfoss (“golden falls”) a magnificent waterfall that falls in steps in to a huge ravine. The geothermal active area named Haukadalur, which contains the geysers Geysir and Strokkur. Strokkur is very dependable and erupts every 5 -10 minutes. Please arrange own airport transfer from your hotel to Keflavik international Airport, as on day 1 when you arrived. Iceland is a young country with extraordinary powerful, rugged and yet very vulnerable and raw nature that demands our utmost respect and great care. We ask every visitor to show respect and positive regards to our precious land at all times as the results of damaged land can be brutal, with fierce sandstorms and heavy rain. Also keep in mind that your best interests of safety are in question as this young and dynamic land can be unforgiving at times with its boiling and therefore brittle surface and isolated areas where we so like to explore and enjoy. 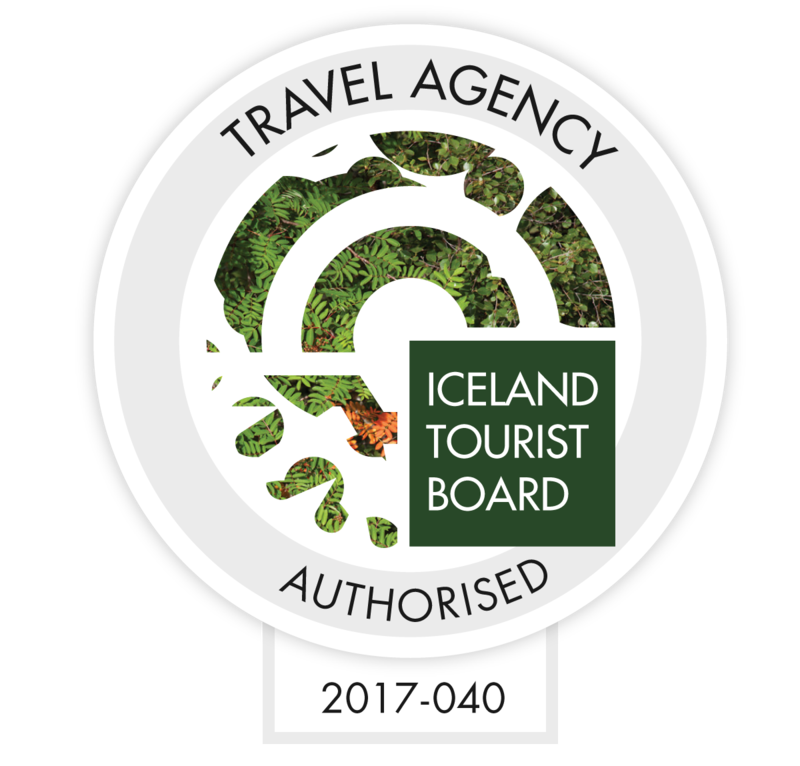 Landvernd, the Icelandic Environment Association works hard to protect and maintain Iceland to continuously be the welcoming and magical island in the middle of the Atlantic Ocean and we take pride in supporting that in every way. Please kindly be aware that Iceland is of very unpredictable nature which is exactly why we love it so much. At times it surprises us with turbulent weathers with short notice, heavy and fierce snow storms, forceful winds and subglacial eruptions which causes water to rise in our rivers. It is consequently possible that roads may close and we thus forced as operators to claim rights and responsibility to alter tours to ensure your safety first. We encourage you to embrace that as part of the adventure. We do, which keeps us on our toes and at the same time makes the country the liveable gem it certainly is.